Doin’ work! Photo: Canary + Co.
Let me set the stage for a minute here. Beautiful morning. Birds are chirping. Waves are flat. It’s the perfect day for a morning yoga session on the beach. But it’s 8 a.m. and you have a Skype conference call at 9. Not to mention a fully packed schedule shortly thereafter. About a year and a half ago, this scenario was all too familiar. How was I supposed to carry ALL my things (yoga mat included) to and from the many places I needed to be throughout my day. It was then that I decided to team up with two other friends (who also happen to be talented designers) to create a solution. 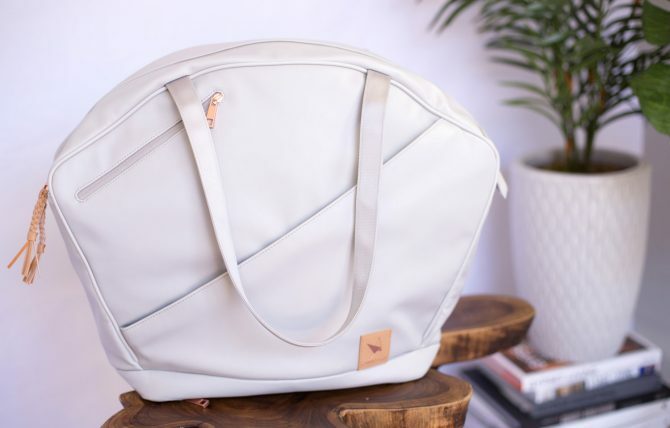 Enter: Canary + Co and this badass bag we designed from scratch to empower women to get through their day.Here are nine reasons why this might be the perfect bag for a life divided between the surf, the yoga mat, and the power outlet for my laptop. “Aloha! !” – The bag. Photo: Canary + Co.
1. There’s nothing lamer than missing that surf/yoga retreat you’ve been looking forward to for the past year because you got tripped up at security. The bag has a flat-open workstation compartment so you can quickly grab and go. 2. It’s a two-fer. As pleasant as it might be to soak your work presentation in yoga sweat, we’ve spared your clients by bringing you a separate, removable gym backpack that is stored underneath the main bag’s internal divider. 3. No more losing sunglasses to the black hole known as the bottom of your bag. A hang rail at the top of our bag keeps track of all the important things: wallet, keys, sunglasses, get creative! As long as it hangs, you’re golden. 4. Do you like puppies? Of course, you do. We haven’t tested this, but with reinforced handle straps made from the same webbing as seatbelts, this bag could theoretically carry A LOT of puppies. 5. Namaste. Durable elastic straps keep your mat or beach towel can stowed away when you’re not using them. No more carrying your bag in one hand and your yoga mat in the other. 6. The cutest little earbud holder you ever did see. No further explanation necessary. 7. Hair and the ocean: It’s a love/hate relationship. Am I right? Pre-surf, post-paddle, whatever the case, our internal leather snap hooks are the perfect place to store bobby pins, hair ties, headbands. You know how it goes. When you need one, you can never find one. 8. Since taking your new Apple Watch Series 3 into the lineup just seems wrong (don’t do it! ), we have a solution: A water-resistant front slash pocket is just the place to store it. 9. This will NOT be another work bag fallen victim to a mound of melted surf wax. Outer material wipes clean in a cinch. The truth is, we are just three girls who feel incredibly strong about giving women who love the outdoors and their careers the tools they need to get through their day. We started this company with the hope that women like you would have one less thing to worry about. We think our collection of bags does just that. We couldn’t be more excited to bring this project to life, and we’d love for you to be a part of it. You can find more information and show your support on our Kickstarter page.